What are Inhalants? Are There Withdrawals from Inhalants Use? Inhalants withdrawal can be so physically and psychologically overwhelming that it can be virtually impossible for someone not to relapse to relieve the negative effects. 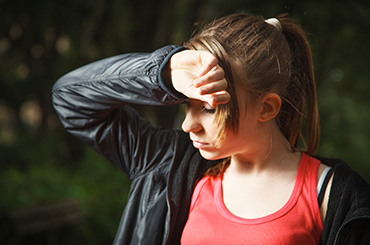 Inhalant-dependent individuals can experience life-threatening symptoms like convulsions. As with many drugs of abuse, the duration and intensity with which someone has been using inhalants determines the level of severity of inhalant withdrawal. The longer and larger the quantity of inhalant usage, the more difficult and dangerous withdrawal becomes. In the most severe cases of withdrawal, inhalant-dependent individuals can experience life-threatening symptoms like convulsions. Withdrawal occurs primarily due to the way in which our body is unable to adapt (after discontinuing inhalant use) to the levels of key chemicals that were disrupted due to inhalant use. Both psychological and physical withdrawal symptoms will be experienced when inhalant use is stopped.When inhalant use is stopped after a period of abuse, an inhalant dependent individual will experience a wide range of physical and psychological withdrawal symptoms until chemical levels are readjusted back to normal levels. Typically, someone who is inhalant-dependent has underlying mental health issues (such as anxiety and depression) that are alleviated by inhalant use. Inhalant use masks the negative emotional states through the rapid increase in chemicals that create a sense of artificial euphoria. Not surprisingly then, when inhalant use stops, pre-existing mood disorders come back in force. It is important to note that while parents are often vigilant about monitoring adolescents for prescription drug/marijuana/alcohol abuse, inhalant abuse is pervasive, but often overlooked. Inhalants are the only class of substance abused more by very young adolescents (e.g. the highest rate of use in the US is among 8th graders). Getting support for your loved one and yourself is important, call 1-888-993-3112Who Answers? to learn more about the resources available for you both. If you, your child or someone you love is abusing inhalants, you need immediate help. Please call 1-888-993-3112Who Answers? for help identifying the inhalant addiction recovery program best tailored to your unique needs. The impact of inhalant use on the heart rate and oxygen capacity can cause death from cardiac arrest and suffocation respectively. Inhalant use is extremely dangerous—both the use and withdrawal can cause symptoms that are life threatening. According to the National Institute on Drug Abuse (NIDA), even intermittent use, or a single episode of use can produce severe, negative effects. Sustained use can damage all the major organs including the brain, heart, liver and kidneys. Strong craving for more inhalants. Inhalant withdrawal is treated both pharmacologically (administering medications to aid recovery) and non-pharmacologically (mutual help groups such as Narcotics Anonymous and behavioral health treatment such as individual and group therapy). A combination of each is usually used since a tailored treatment plan can increase abstinence. health care workers are often advised to assume that chemical dependency and mental illness need to be addressed during inhalant withdrawal for long-term recovery to be successful. According to the World Health Organization (WHO) evidence-based guidelines, the first course of inhalant withdrawal management is administering benzodiazepines to reduce symptoms and prevent psychosis, irritability, insomnia and violent behavior. Inhalant abuse is a chronic disease of the brain, and the most effective treatment options are long-term. Treatment needs vary based on someone’s specific situation. Call 1-888-993-3112Who Answers? to discuss which treatment is more suitable for you or your loved one to transition back into a sober and drug-free lifestyle. There are many outstanding programs available that provide short-term and long-term inhalant recovery treatment services. Typically, the decision to pursue out-patient or in-patient treatment comes down to the capacity to adapt daily life, the financial commitment, and the recommended course of treatment by the medical practitioner working with the person in recovery. Treatment needs vary based on your specific situation. Call 1-888-993-3112Who Answers? to discuss which inhalant abuse treatment is more suitable for you, or your loved one, to transition back into a sober and drug-free lifestyle. Being physically present for your loved one in withdrawal is probably the best support you can provide.There are no evidence-based guidelines to walk you through being present to someone going through inhalant withdrawal. As mentioned above, inhalants are often used because someone is unable to manage their emotions and/or are trying to self-medicate to ameliorate their mood. Consequently, when going through withdrawal, someone who has been using inhalants becomes the worst version of themselves, and they have the potential to become even worse. Caring for someone going through inhalant withdrawal is almost impossible. Nothing you do as a caregiver will ever be right. Being physically present for your loved one in withdrawal is probably the best support you can provide. For the inhalant-dependent loved one, knowing that you are there, and sticking around during the most confusing times means a lot. Marsolek, M et al. Monitoring trends by using poison control data, 1993-2008. Pediatrics 125(5):906-913, 2010. Perron, B et al. Inhalant Withdrawal as a Clinically Significant Feature of Inhalant Dependence Disorder. Med Hypotheses. 2009 Dec; 73(6): 935–937.